We're kicking off the holiday season with a whole weekend of fun and festive events! First up is a special edition of First Friday on December 1st, including craft making for the kids, music for everyone, and of course, fantastic food for all. The fun starts at 5pm. On Saturday, it's the holiday lighting of the Venice sign at Windward Circle from 6-9pm. This is always a fun event with special celebrity Venice residents to do the honors and a lively crowd to cheer them on. We wind up the weekend by sliding down the hill - the snow hill, that is. Yes, real snow under the palm trees! 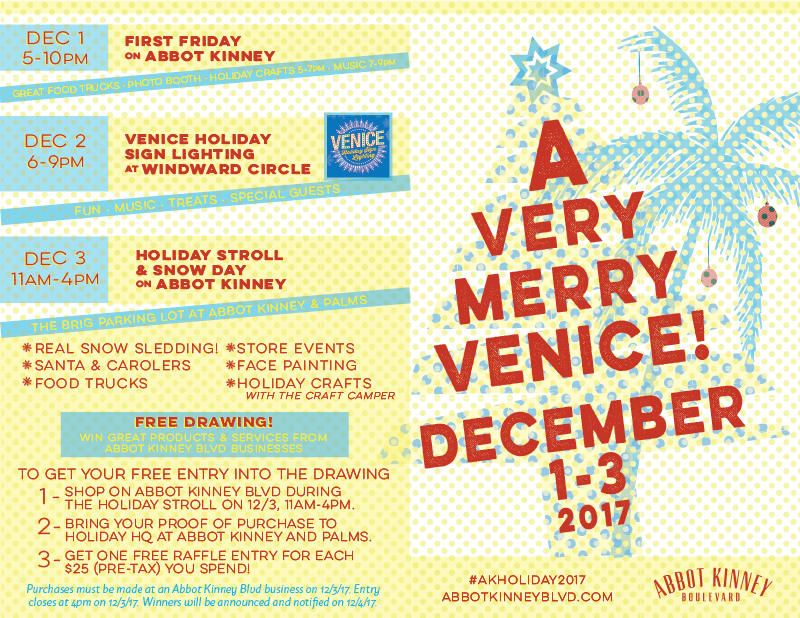 The Holiday Stroll and Snow Day is a much-loved tradition on Abbot Kinney with Crafts, Carolers, Snow, Sledding, and Santa. We're back at The Brig lot this year, starting at 11am.